Mike Sexton was born on September 22, 1947 in Shelby, Indiana. He was given the nickname “The Ambassador of Poker” because he is constantly promoting poker, whether it be through writing books and magazine articles, or just doing his commentary on the World Poker Tour. Mike Sexton started playing poker games when he attended Ohio State University. After graduating he served in the army for a few years, and afterwards got a job as a salesman. He was playing poker at night, and winning more money than he made at his salesman job. Mike quit his job to play poker full-time. Mike enjoyed playing in poker tournaments, but was never able to enter the World Series of Poker because he also coached Little League, which caused schedule conflicts. 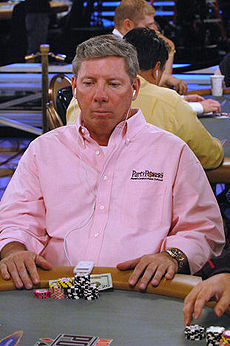 Mike moved to Las Vegas in 1985 in order to play more poker. Since he moved to Las Vegas, Mike Sexton has had a lot of poker success. He has over $3 million in cashes, $1.1 million of which is from the WSOP alone. Mike Sexton has 50 cashes at the World Series of Poker, including a victory at a Seven Card Stud Split event in 1989 to win his first WSOP bracelet. Mike also won the 2006 WSOP Tournament of Champions when he defeated Daniel Negreanu in heads-up play to win the $1 million prize, half of which he donated to charity. Although Mike Sexton considers himself a poker player before a commentator, he doesn’t play in tournaments as much as he used to, thanks to his jobs as WPT commentator and Party Poker spokesman.